As the summer of festival season ends, it comes with a mix of emotions. Sadness that there are no more ridiculous stories, with cans of warm beer and glitter that stays in your scalp, as well as excitment to not be sleeping on a cold wet ground as your bag got soaked in the British downpour. However for anyone wanting a great middle ground festival for amazing music with less of the craziness associated with Glastonbury and Reading then Isle of Wight festival is the one. If you're coming from London, you can get a bus or a train to places such as Southampton or Portsmouth. I chose the former. Whilst a bus can be about £10 return compared to a train of £10 each way, a train is the better option when speed is of the essence. From there, a shuttle bus to the Red Funnel ferry (which is free for ferry travellers or a few pounds if not) which takes about twenty minutes. Then it is a ferry which for foot passengers can be about £10 and takes an hour. Car drivers can also use it if they want to drive to the festival but this can cost a lot more. Had enough yet? Then there is getting to the actual festival from the Isle of Wight port. A return bus for £14 or a return boat for £10 will finally get you to the festival itself. Then the queue to get in; this year was obviously a tricky year to gauge with the recent terrorism threats so it took us about two hours to get in on the first day. Yet this could be much worse and Friday entries apparently walked straight in. After all this, you're in! This whole journey can take about five hours so beware of timing and leave as early as possible. 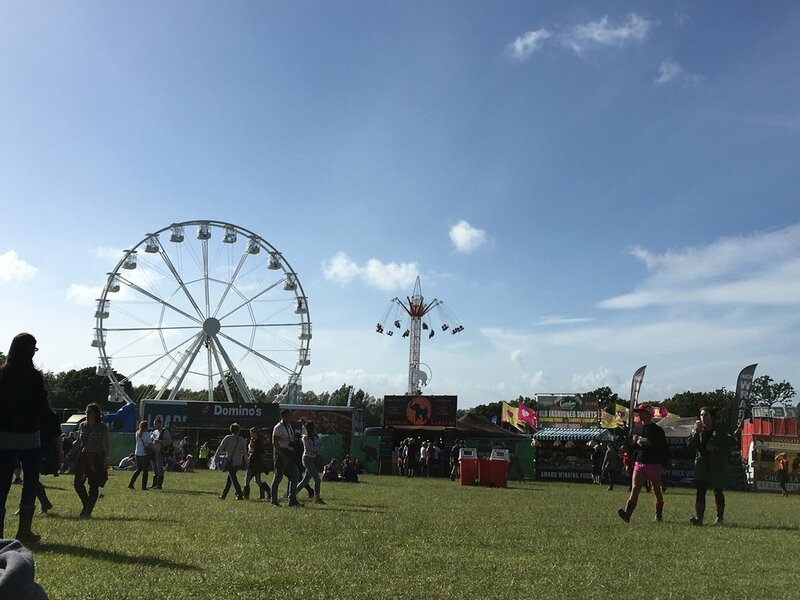 Heading straight to the festival will show a variety of campsites; Tangerine fields for the prepaid wigwams, the Respect field for people who wanted a quiet time. 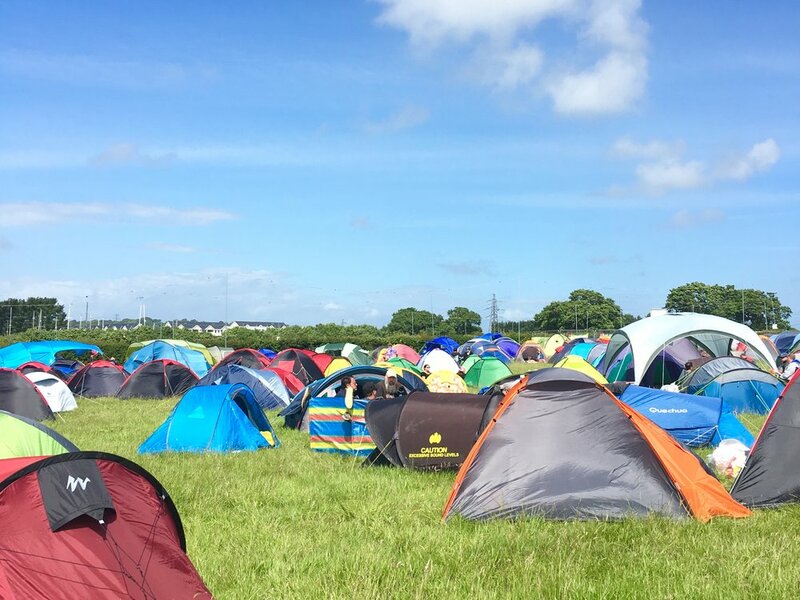 Most festival seekers will go for the Blue or Purple fields which aren't much further out but have a great vibe. Top tip? Don't pitch up as soon as you get in. Some of the tents ended up being pure slush after everyone walked past it in the rain. The best spot we found was a campsite at the back, with a path through the middle that no one really walked through, but was still close to the bathrooms for late night runs but not close enough to smell them. It's also worth noting the food situation. Obviously you don't want to be taking loads of heavy crates and food: however, the nearest supermarkets are Newport and a half an hour walk away. In the sun this is fine as they shut off the roads for festival goers to head to Morrisons/Sainsbury's/Lidl/Aldi. Yet in the rain which heavy crates not so much. So I'd say try and do one run for the weekends and then get the festival bus back for an extortionate £4 for the journey that saves you from trekking back, which is outside the Morrisons. Otherwise, that is it! The crowds are nothing chaotic; the mix of young teenagers and oldies means there is always space to weave through, and one that meant I was always less than five rows back for all my favourite bands. It's remarkably well run, with clear information, well-running transports and even the loos cleaned regularly enough that the portaloos were fantastic compared to the Glastonbury troughs. With tickets for just £170, if you get the first release, it can be a much cheaper weekend then other festivals that still has great vibes just with more space and more chill. We probably spent another £80 for the week there on alcohol and food and transport only came to another £40 for all three of the parts (train + bus, ferry then boat).